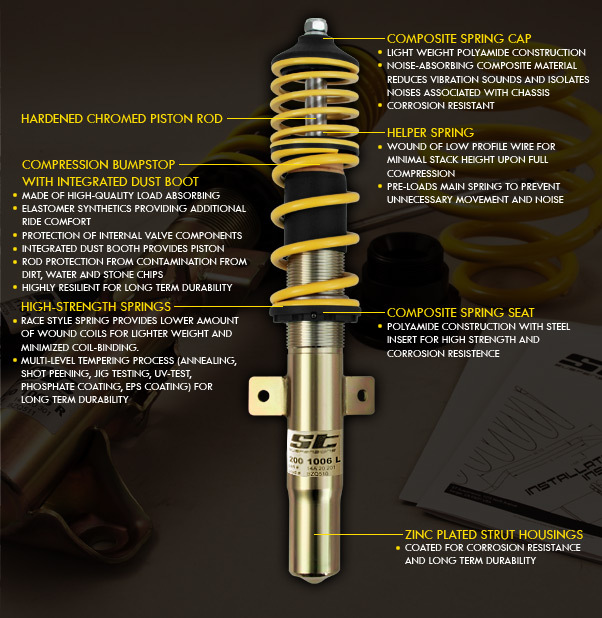 If you are looking for a great affordable coilover for your Hyundai Genesis Coupe? Most affordable coilovers are knock off brands that are all made in china, but not these ST Coilovers! ST is made by the world famous KW, and uses the same machinery and processes they use on their more expensive KW line of coilovers. The only difference is the material they use. ST coilovers use galvanized steel instead of stainless steel, however if you live in a dry/warm area, these ST coilovers are perfect for you! Tired of the offshore Knock-Off Coilovers? If you answered yes to anyone of these questions, ST Coilovers are the choice for you! ST Coilovers are constructed of high grade steel, and heavy galvanized for great rust protection. ST Coilovers offer only a non-dampening adjustable solution along with the height adjustability, just like the KW V1’s. ST Coilovers offer a 5 year Limited Warranty to the original purchaser.